With Ella's birthday 2 weeks after Sara's, I knew that I wouldn't be up for a mom-intensive party. 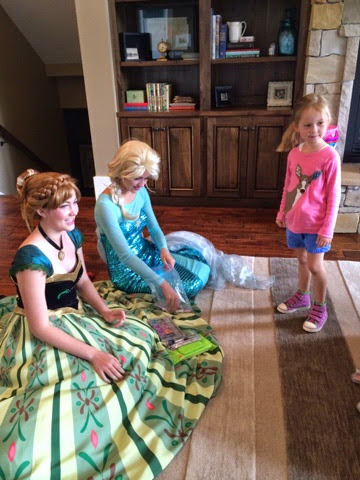 Ella wanted a Frozen party (surprise, surprise) so we called in the big guns. Elsa and Anna. These princesses saved the day. They sang songs, read stories, made snow (real snow, mom. It almost melts. ), gave out stickers and did glitter tattoos. They were the best. We also played "Don't eat Olaf" which the kids loved. The game didn't make a ton of sense to me, but the kids loved it. It's all about knowing your audience, I suppose. I had great plans to take each girl's picture with Elsa and Anna, print it out, and take it home in a foam picture frame that they had decorated. But of course, our printer decided to wig out and not print properly, so all the photos looked like they had a crazy 70s filter on them. It was short and sweet and a fun party. 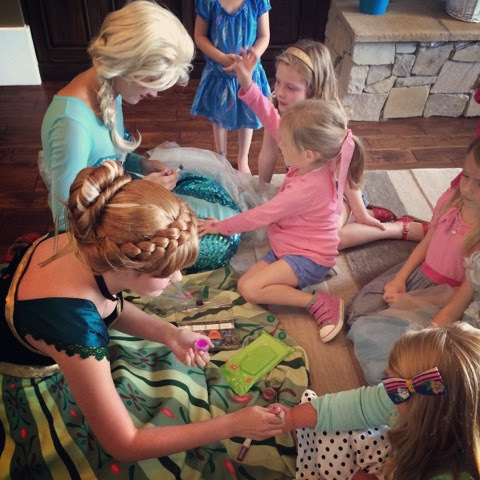 Anna is already planning her Frozen birthday party!